One of the key advantages of LED technology compared to other lighting technologies is its reliability and long operating life. The light output of an LED tends to gradually degrade over an extended period of time, compared to a halogen or incandescent light source which fails abruptly. Incandescents are deemed as 'failed' when the fillament breaks and the bulb no longer emits lights, LED's however will gradually decrease in light output over an extended period of time. This raises the question, what constitutes a failure point or lifetime of an LED. To solve this, the LED industry developed the IES LM-80 and TM21 standards which specifies how LED manufacturers can test LED components to determing their performance over time. As a result lifetime predictions where measured in terms of L70, which is the point at which the light source is at 70% of its initial lumens (or a 30% loss in output). As LED technology developed, lifespans increased and the 70% figure of L70 was commonly being reached at durations exceeding 60,000 hours. This lead the industry to adopt additional ratings such as L80 (80% of initial lumens) and L90 (90% of initial lumens). 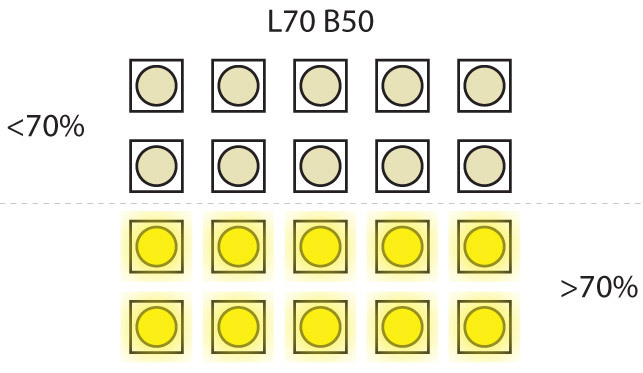 In other words a fitting rated at 50,000 hours L90 would retain 90% of its light output at 50,000 hours, whereas a fitting rated 50,000 hours L70 would only retain 70% of its output. With further advances in technology, the question of lifetime reliability became more of a focus in lifetime testing. Some forward thinking on behalf of the LED industry saw the introduction of a B value to compliment the L values already in use. Prior to the introduction of the B value, L values (L70, L80, L90) were based on a 50% pass rate. That is to say, 50% of the tested light sources had maintained their light output to the L value specified. 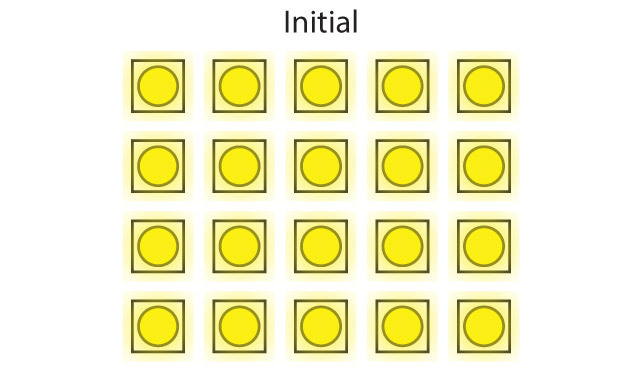 The purpose of the B value was to indicate the percentage of light sources that didn't meet the criteria stipulated by the L value, giving an indication of the reliability of a light source to reach its stated lifetime. 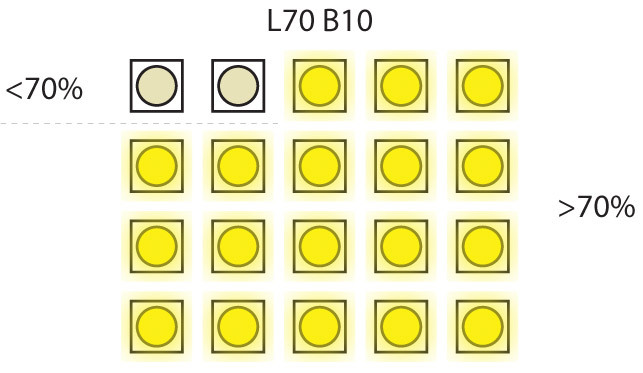 The above example of L70 B50 and L70 B10 results shows the difference in how reliably a light source will achieve its target output over its lifespan. This system can be applied to L70, L80 or L90 in the same manner. For example a luminaire could specify L80 B10 which would indicate 10% failure to reach 80% light output at the specified hours, or L90 B50 which would indicate a 50% failure to reach 90% of the light output at the specified hours. A perfect result would be indicated by L100 B0, meaning 100% light output with 0% of sources failing to meet that target, however this target is impossible to meet. Typically Trend Lighting LED's achieve a lifetime of >50,000 hours L80 B10, which indicates that after 50,000 hours 90% of the luminaires will retain 80% of their initial lumen output.